Profiles of WW1 veterans are being researched and written as an ongoing project and will be added as attended. 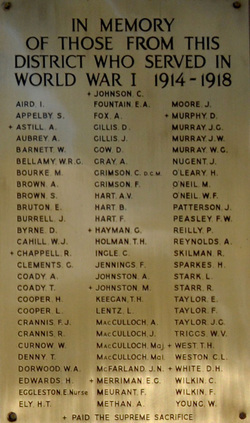 The soldiers listed have a strong connection to Cumnock and other areas such as Baldry, Eurimbla, Gumble, Obley, Wellington & Yeoval and are often also listed on other Honour Boards. ​Those profiles that are available are listed in blue font. Click on the name to bring up individual profiles. There are 3 soldiers unidentified and are listed in red font. Anyone with information on who these soldiers may be, please use the 'contact' tab to email us regarding them. ​There are 82 names listed on the Cumnock WW1 Honour plaque. We have also identified 15 other veterans who we have added to our list below as they had strong Cumnock connections and they have a * sign after their name. There are a total of 97 names. Around 33 soldiers (approx. 34%) from the Cumnock district paid the Supreme Sacrifice during WW1. Those who were killed in action or died while in service from wounds or disease are in bold font and have a + sign after their name. Pte Thomas DENNY - 5002, 17th Btn, France. Captain Aubrey REYNOLDS - 582, Light Horse & Camel Regiments, Egypt, was Mentioned in Dispatches (MID). Two father and son family members were Frederick CRANNIS and his son Roy, and Ambrose INGLE and his son Cyril. Eva EGGLESTON & Jane GANT. Eighteen Gallipoli veterans from the Cumnock district have been identified. Only Thomas Murphy died at Gallipoli. ABERNETHY, David; APPLEBY, Sidney; BARNETT, William; BRUTON, Robert; FARR, Harold; GRIMSON, Charles; INGLE, Cyril; JOHNSTON, Arthur; JOHNSTON, Major; LORD, Claude; LORD, Raymond; McDONNELL, Percy; MURPHY, Thomas; REILLY Percy, O'LEARY, Herbert; REYNOLDS, Aubrey; WHITE, Donald; & YOUNG, Walter.